Maureen: I thought it was good, but it felt really dated to me. Maureen: Some of the recipes felt like they were about 7 years old. There was lots of balsamic vinegar used, for example. Kirsin: The book is old, right? Maureen: That would explain it! Kirstin: It’s 2011 book, but it doesn’t come across like that at all. Maureen: What did you think? Kirstin: The recipes I cooked were amazing, and they all worked. There were no issues with it at all. There were a lot of real winners here, including the roast chicken, chicken with the lemon and the balsamic roast beef. And I love that she asks How Easy is that? Well, super easy! Kirstin: I would recommend the chicken with the lemon because it made the house smell amazing. A phenomenal recipe as well. Maureen: I”m trying to remember what we liked, but what really stood out were the bangers and mash, which were a disaster. Kirstin: What about the cakes? M: They were delicious. The salmon was delicious. We loved the lamb chops. I’m still not sure if I’m going to keep the book, but we certainly ate well this month. Overall Grade (A- F): A (Kirstin): The children really liked all of the recipes and they all worked. C (Maureen) I would have given it an American C+, but we’re sticking just to letter grades. It was a good cookbook, but not particularly inspiring. Grade for Photography (A-F): B/C She makes it all look like a Martha Stewart magazine. But I get that she’s trying to make it approachable. No food stylist for her! Any disasters? Kirstin: No. Maureen: Yes. We’re still having nightmares about the bangers and mash. Bookshelf or Charity Shop Donation? Kirstin: Bookshelf. If it hadn’t been a gift, it might have headed to the charity shop. Maureen: I haven’t made up my mind yet. I might send it home with my mom, so it can return to its American roots. If you would like to make this yourself, click through on this sentence to see the recipe, as posted on FoodNetwork.Com. This was absolutely yum. 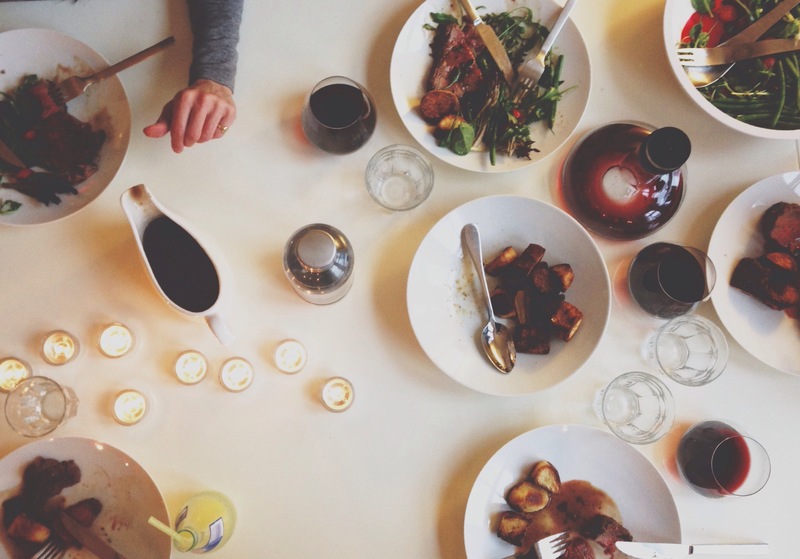 We all–even the boys– went back for seconds, and in some cases, thirds. This surprised me since they’re not huge lamb eaters, but hey, it was delicious. Having lamb was at the request of my parents, who are visiting. They live in The Middle of Nowhere in the United States, and apparently it’s impossible to find lamb there. 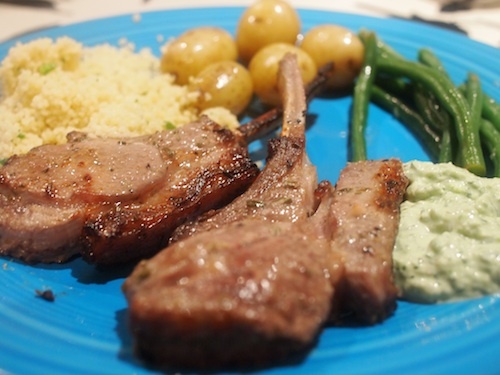 For me, I can get lamb only after a two-minute journey to my local butchers, Dring’s. Wanting to keep my parents happy, we got the lamb. In the U.K., lamb is getting expensive. The butcher explained the reason why. In the past, the British would be big eaters of lamb from New Zealand but in recent years, the Kiwi lamb has been going to Asia and is not reaching our shores. For that reason, the lamb we’ve got left is becoming more expensive. This dish requires a bit of foresight because you have to marinade it. I marinated it about three hours, but as with all marinades, the longer you do it, the better it will be. But once that’s done, all you have to do is throw it on to the barbecue or, in our case, under the broiler/grill for 10 minutes and Bob’s Your Uncle. The yogurt mint sauce is an option, but I would definitely make it if I were you. It was simply a matter of throwing nine ingredients in a food processor and you’re finished. Again, it helps to do it a few hours ahead of when you’ll want to eat it so that the flavours can get to know each other before you eat them. Will I make it again? Definitely. Another winner from the Barefoot Contessa. I have to say, this month hasn’t been incredibly inspirational, but it has been delicious. Peter: This looks like it was quick. Anna: It was. Super quick. Anna: That’s primarily down to the quality of the steak. Because this isn’t really a recipe. 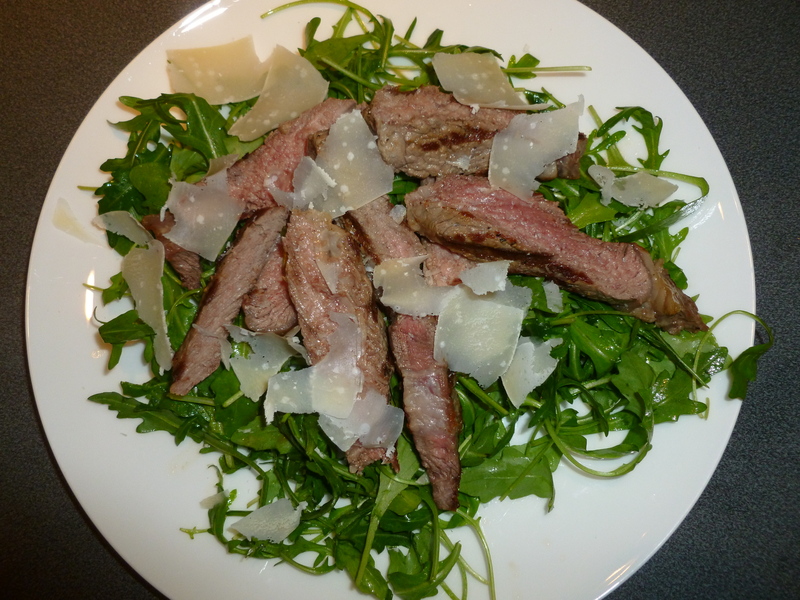 Rocket, steak, parmesan, bit of dressing, done. Peter: Yes, it’s a bit like how you serve steak when we do it on the barbeque. Anna: And we don’t need a recipe for that! Peter: I like this. What’s in the dressing, apart from mustard? Anna: Well there’s tarragon in it. And it’s supposed to have tarragon vinegar, but I couldn’t find that. So I used cider vinegar instead. Peter: There’s a lot of this. I’ll be having the leftovers for lunch tomorrow. Anna: I liked her tip for doing the chicken, roasting it on the bone and then shredding rather than poaching. But this did mean that it took quite a while to make dinner which isn’t so cool on a school night. Peter: This would be good as a salad at a barbeque or a party. Anna: You’re right. Honestly I find it a bit boring. So I don’t think I’ll be going out of my way to make it again. Sorry. Peter: I love you more than when we first met! Isn’t that what I’m supposed to say? 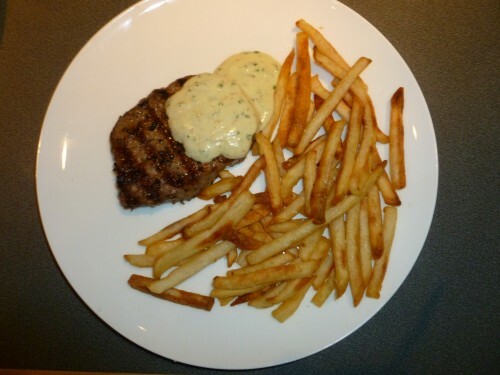 Peter: I was a bit nervous about the volume of cream in this sauce. But it’s very tasty. And not evidently cream-based. Peter: Well alright then. But it tastes of cheese. So that disguises it. Anna: I love this sauce. I am eating way too much of it. I’m dipping my chips in it. It’s everything a sauce should be. Peter: You do seem to be enjoying this artery-furring special. Is that your heart pounding with love? Or blood trying to get past the impending clot? Anna: I feel a bit sick now. Alex: Oh great!!! Roast beef. When was the last time we had roast beef? Tom: Probably when we came to you for lunch before Christmas. Kirstin: And that was mighty fine beef then too. Georgia: Oh thank you for giving me a great chunky slice. I can’t stand wafer thin slivers! Tom: It’s me having a steak. Georgia: That’s exactly what it is. Ella: What’s on the outside of the beef? Kirstin: A mixture of balsamic vinegar and mustard. Kirstin: Isn’t it? We are definitely making this again. 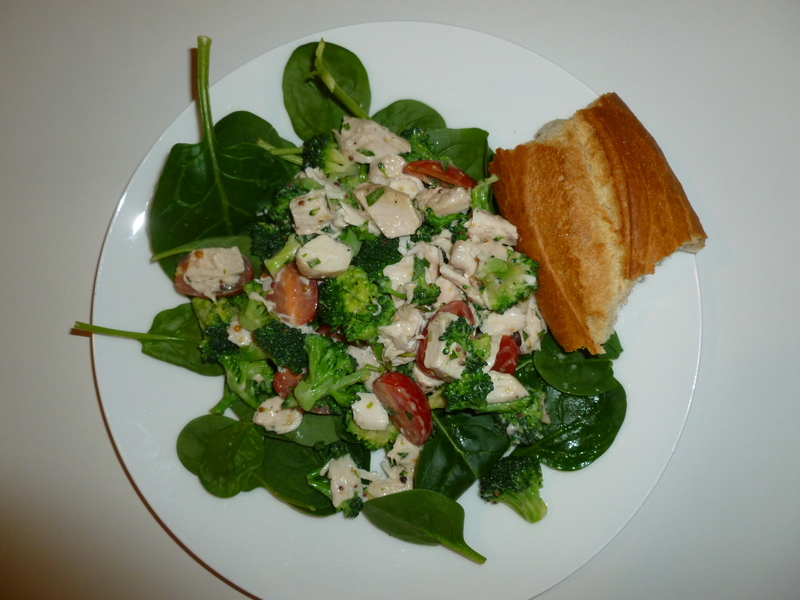 Easy, yummy and delicious. Total winner. Happy Valentine’s Day, everyone! If you would like to make some for your Valentine, click through this sentence for the recipe, which is a good one. Nicholas (9): This icing is amazing. Andrew (13): There’s a good ratio of cupcake to icing on this. Maureen: That’s important. Too much cake with too little icing and it’s not really sweet enough. Too much icing with too little cake and it’s overly sweet. You have to get it just right. Andrew: This one is just right. Maureen: Are they red enough for you? Nicholas: No! They’re not at all red. Just as I predicted when we were making them. Maureen: This is a perennial problem with red velvet cupcakes. 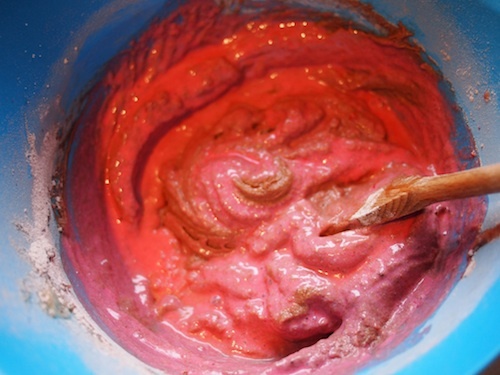 Since they’re chocolate cupcakes, you have to add A LOT of red food colouring to get them red. The reddest ones I ever made were from the Hummingbird Bakery cookbook, but I think I added two full bottles of red food colouring to get the hue. Tim: They might not be red, but they’re very nice. Maureen: This was a good recipe for red velvet cupcakes. It was very easy, and the icing was good too. It’s definitely a keeper, even if they aren’t red enough. See? Pink here, not at all red or pink once baked. Red is a tricky food colouring though. 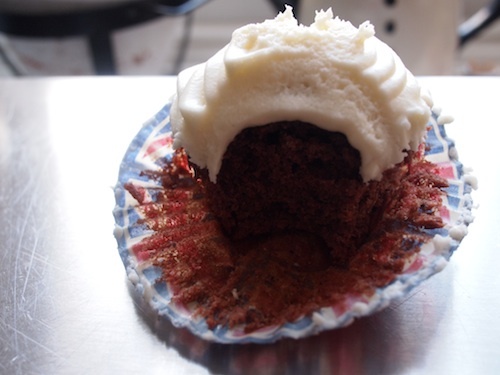 The secret, if you’re really determined to have a red cupcake, is to use red paste food colouring. Then it would be red enough.